S.H. Jucha was a senior manager in the technical education and software development industries, with degrees in biology and broadcast communications. He is the author of the science fiction series, "Space.com's Expert Voices: Op-Ed & Insights. 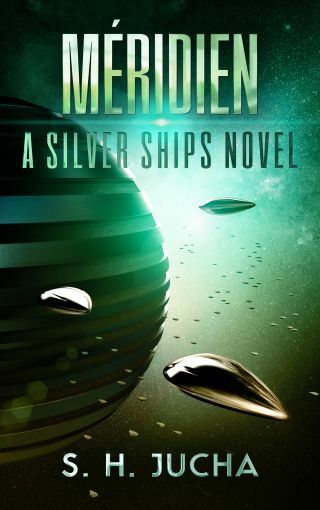 S. H. Jucha recently published his third novel, "Méridien" (self-published, 2015), concluding his Silver Ships trilogy, which started with "The Silver Ships" and was followed by "Libre." The novel continues the story of Alex Racine, who risks his life to come to the aid of an entire civilization in dire need and discovers worlds full of genetically-sculpted people, advanced technology, artificial intelligences and an alien swarm. Read Jucha's recent Space.com Op-Ed at Space Travel and A Futurist's Thoughts on Trash and an excerpt from "Méridien" below. Reprinted from Méridien, A Silver Ships Novel Copyright © 2015 by S. H. Jucha. Published by S. H. Jucha. "Does your world not welcome us, Admiral?" Director Tomas Monti asked Admiral Alex Racine. "My people would welcome you, Director Monti," Alex replied, "if they knew you were here, but your presence won't be announced to my people by the new President, Clayton Downing, who has recently taken office." The Co-Leaders of House Alexander, Alex Racine and Renée de Guirnon, sat in a meeting with the flotilla's officers and Directors aboard the city-ship, Freedom, regarding the unexpected message they had received from the Sharius outpost orbiting Seda, which had relayed President Downing's order to stay out of the New Terran system. Tomas Monti had every right to be concerned. His entire planet of Independents, having narrowly escaped the invasion of the Arnos system by the alien silver ships, had fled Confederation space for New Terra, Alex's home world. When the flotilla exited FTL outside the Oistos system, Terran Security Forces outpost commander, Colonel Marshall, had delivered the President's terse order. The message heralded horrific news. President McMorris, the Méridiens' friend and supporter, was no longer in office. A power-hungry Assemblyman, by the name of Clayton Downing XIV, held the high office, and Alex's conscience warned him that he may have been responsible for the change. While the Rêveur had been under repair at New Terra, preparing to return home to the Confederation, someone had stolen the Transfer Station's database of extremely valuable Méridien technology. The Rêveur's SADE, Julien, subsequently had broken innumerable New Terran laws tracing the financial and communication pathways from the engineer who'd stolen the data, back to the individuals who had masterminded the theft. The trail had led to the offices of Samuel B. Hunsader, the CEO of Purity Ores, one of the system's largest mining companies, and Hunsader was a key supporter of Assemblyman Downing. When Alex had exited the Oistos system with the Méridiens and their restored starship, which had been damaged by the silver ships, he had ordered Julien to discreetly send the data to President McMorris with a warning to be careful. "Is this President an important position on your world?" asked the ex-Leader of the Méridiens' House Bergfalk, Director Eric Stroheim, as he looked around at the heavy-worlders, the New Terrans. "Our people elect our world's leader, Director Stroheim," Captain Andrea Bonnard said. "The leader's title is 'President,' and the person serves for five years before elections are held again." "Incredible … each of your people has a vote, a say in who leads them," said Tomas, shaking his head in wonder. As a Méridien, an elected President had no comparison to his people's Council, which consisted of House Leaders and held absolute power over the Confederation's billions of people. "I have met this man, Clayton Downing, Sers," Renée told the Méridiens. "You would find it difficult to conceive of his nature. Our people have strived for continuity of thought and action. And although we have come to value the New Terrans for their independence since they have produced the likes of the Admiral," Renée said as she touched her lover's shoulder, "they have also produced the likes of Clayton Downing, a perversion of humanity." "What is the purpose of this meeting, then, Admiral?" Eric Stroheim asked. His House had once been the caretakers of the outcasts of Méridien society, the Independents. When the silver ships had consumed six Confederation colonies, the Méridiens began fleeing their home world, and the Council abandoned all responsibility for the Independents on Libre. As House Leader, Eric Stroheim took it upon himself to save the quarter of a million people stranded on the planet. Even working together, the Independents and House Bergfalk wouldn't have completed their exodus in time before succumbing to the silver ships without the Admiral's help. In gratitude and to demonstrate continuity, Eric and Tomas had joined the Co-Leader's newly formed Confederation Military Arm, House Alexander, as Directors of the civilian support arm. Alex and Renée had created House Alexander as a guise of operation. It was a foregone conclusion that the Confederation Council, when they finally stopped running long enough to examine the petition, would never approve the new Méridien House. House Alexander now counted nine ships among its assets: two giant city-ships, two freighters, one armed shuttle, and four passenger liners, including the Rêveur, which had been lost for seventy years until the Admiral rescued it and revived the eighteen Méridiens in stasis. "Director Stroheim," Alex said, "Julien is working to discover what has transpired in our absence. Right now, we are here to focus on our primary strategy … the end of the silver ships." Senior Captain Andrea Bonnard and Commander Tatia Tachenko shared wolfish smiles. They had surmised the purpose of the meeting and were anxious to take the fight back to the brood of fighters and their mother ship, an enormous sphere that transported its drones from one star to the next. The aliens had just chased the flotilla out of the Arnos system, and everyone wanted payback for the 2,200 elders left behind when time ran out. As it was, the flotilla, with its shuttles failing and an incomplete city-ship struggling to make its launch, had engaged in a running fight with the silver ships to safely reach the FTL exit point. "We know that the silver ships," Alex continued, "are not at their most vulnerable right now, densely packed around Libre as they are and mining it for resources. But I'm not willing to wait eight to twelve years till they lift and head for a new destination. We know enough about their weaknesses to defeat them and just need to finalize our preparations." Alex linked his Méridien cerebrum-embedded implants with those at the conference table and sent them his battle plan. Some in the room were still coming to grips with the manner in which the Admiral bypassed their implant security protocols whenever he wished. In polite Méridien society, it was an unheard of intrusion. To Alex, who had possessed his twin implants for less than a year, it was expediency. "I see the Unsere Menschen will be left behind," Eric said, indicating the city-ship that was his responsibility. "I need one staging platform, Director Stroheim, for the trip back to Libre," Alex replied. "That will be the Freedom. The Unsere Menschen has extensive construction and outfitting to complete; it won't be ready in time." "But if we are excluded from your system, why are we even contemplating these actions?" Eric asked. "Director," Renée interjected. "You forget that I have spent a half-year in the company of the New Terrans. Despite this unexplained transition to a new President, I can assure you that the New Terran people do welcome us." "Listen up, people," Alex said. "Focus on our battle preparations, your ships, and your supplies. When we have access to New Terra — and we will have access — be ready to implement your part of the plan. As for my officers, assume the Transfer Stations, including Barren Island, will be at your disposal. Directors, access your SADEs' files on these locations so you understand their manufacturing capabilities. Julien has already transferred the data to your ship's SADE." More than one of Alex's officers exchanged glances and relayed private comments via their implants. They had just been warned by the new President to stand off the system or force would be used against them. Now, Alex was telling them that he intended to ignore the order. It was one thing to fight the alien silver ships, but what if they had to fight their own people? Prior to his meeting, Alex had a short conference with his ship's SADE. <Julien,> Alex sent, <I need to know what's going on. How is it that Downing is the President? Get me a summary of the news since we left half a year ago. You need to do it quietly.> Alex and Julien shared more than a few personal code words. "Quietly" meant Julien was to find the information wherever it was located and regardless of whether it was a public or a private source, but in the latter location, leave no footprint. <Understood, Admiral,> Julien had replied. <Should I request the help of Cordelia and Z?> Julien had added, referring to the SADEs of the Libran's massive city-ships. In the quiet that had followed, Alex felt concern for the changes that Julien, the Rêveur's artificial intelligence, had wrought in his programs since their meeting. <Are you sorry we went down this path, my friend?> Alex asked. <Then perhaps this is something that you should do alone,> Alex had sent. <I would agree, Admiral,> Julien had replied. When Alex had closed the comm, he'd flashed back to the several times when he had thought of McMorris, only to inexplicably have the President's face morph to that of Downing. He'd shuddered at the recall of those eerie moments. When Alex's meeting broke for midday meal, the group ate in one of Freedom's 300 meal rooms. This one accommodated a mere 500 people in one sitting. As was the Librans' new custom, servers waited on Alex and his guests, refusing to allow them to serve themselves. It had become a habit of the Independents following the day a New Terran tech, Bobbie Singh, gave his life to save Amelia, a Méridien child. In the Confederation's carefully managed worlds, a long and safe life of nearly 200 years was expected. The silver ships had destroyed all that, and Méridiens still struggled to adapt in the chaos. The servers rearranged tables with the aid of the ship's SADE, Cordelia, who signaled the nanites in the bases of smaller tables and chairs to release. Once they were repositioned to seat Alex's extended group, Cordelia signaled the nanites to reattach to the deck. The Librans served them from food dispensers located along the rear of the meal hall. Méridien technology was far advanced over that of New Terra, and it extended to things such as food preparation. Méridien controllers ran recipe choices and blended food stocks, preserved by nanites, into tantalizing dishes. Young people, some children, brought trays to their guests — one for each Méridien, two for each New Terran, and three for the Admiral. The Méridien home world, founded over 700 years ago, had a lighter gravity than Earth, producing more slender people over the generations. The New Terrans had found a heavier world to colonize, and it showed in their dense bone and musculature structure. Alex had developed a formidable physique as a young boy and teenager assisting his father with the retrieval and handling of space junk. He and Renée, with her genetic sculpting, made quite the contrasting pair. Where he was massive, she was slight. Where he was handsome in a rugged way, she had a surreal perfection only centuries of genetic tinkering could create. Conversations wandered around the meal table, except for two New Terrans, Andrea and Tatia, who weren't saying a word — not out loud. Their conversation was private, implant to implant. <Check the timetable, Captain,> Tatia sent. <Check the weapons section,> Tatia continued. Andrea's XO and Commander, Tatia Tachenko, was an example of New Terra's robust women, a blue-eyed, buxom blonde. She also rightfully considered herself House Alexander's de facto armorer. <Libran-X missiles … 240 silos?> Andrea queried. <That's not all he needs the city-ship to carry,> Andrea replied. <Look at the fighter count. The Money Maker can't load that many fighters.> Andrea was referring to the flotilla's converted freighter, now their fighters' carrier.